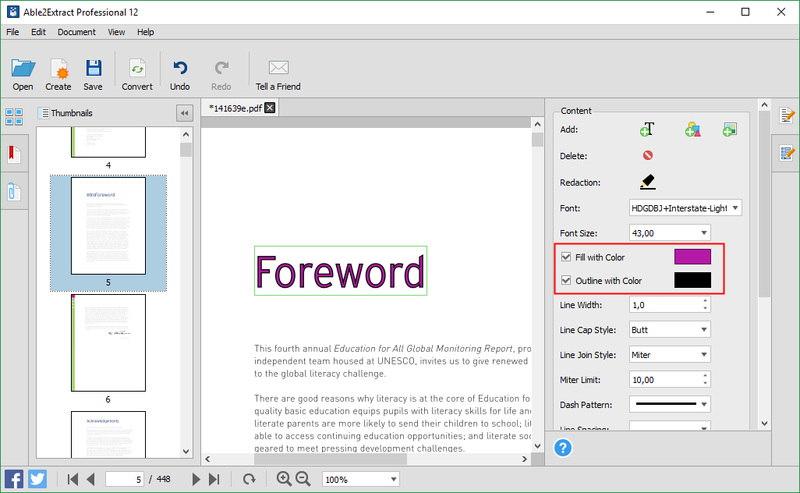 Today we are going to show you how to edit PDF files in any way imaginable, using simple follow-along tutorials with screenshots. 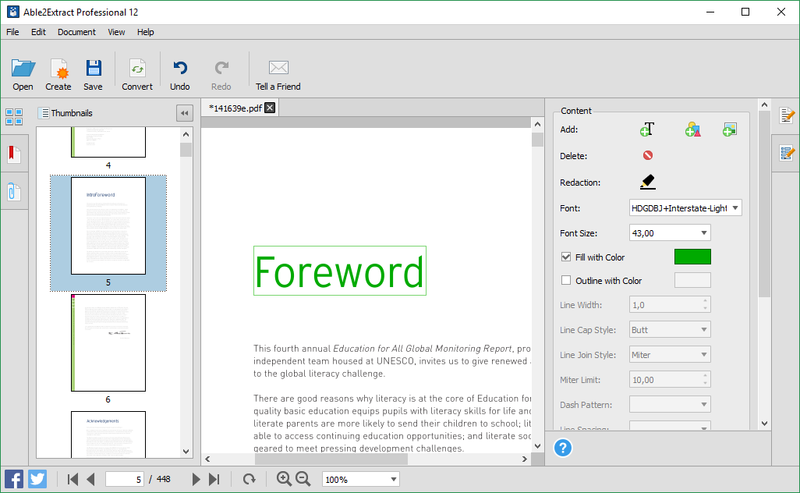 We all know that PDF editing is an annoying obstacle that you just have to deal with at some point. 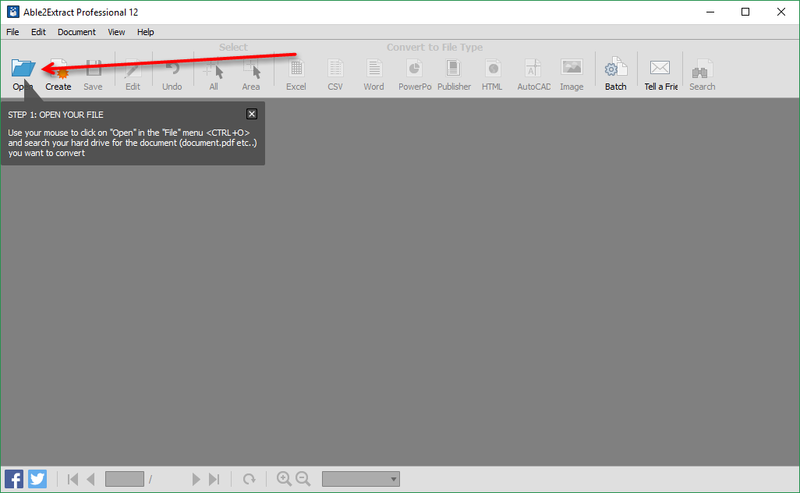 The main culprit for that is the PDF itself, as it isn’t a file format you can edit right out of the box. And whether it’s editing PDF text directly or editing PDF content after converting it to Word, it’s still a boring task because, most of the times, it’s a super slow process. Since you’re reading this, chances are you’ve have strayed into a tough spot with a certain PDF document. Don’t worry, as that is a common place to be. Fortunately, we’ve prepared a complete guide that teaches you how to do just about anything with your PDF, either scanned or native. Even better, this is the only cross-platform tutorial online, as everything applies to Windows, Mac and Linux operating systems. 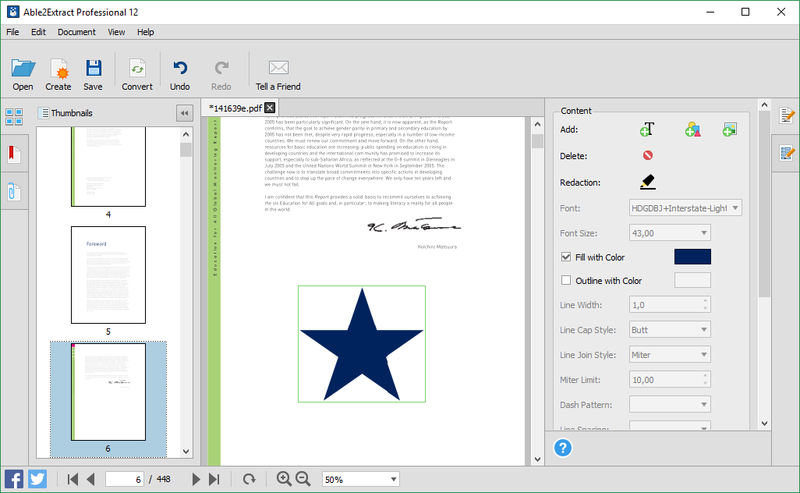 Able2Extract Professional 14. 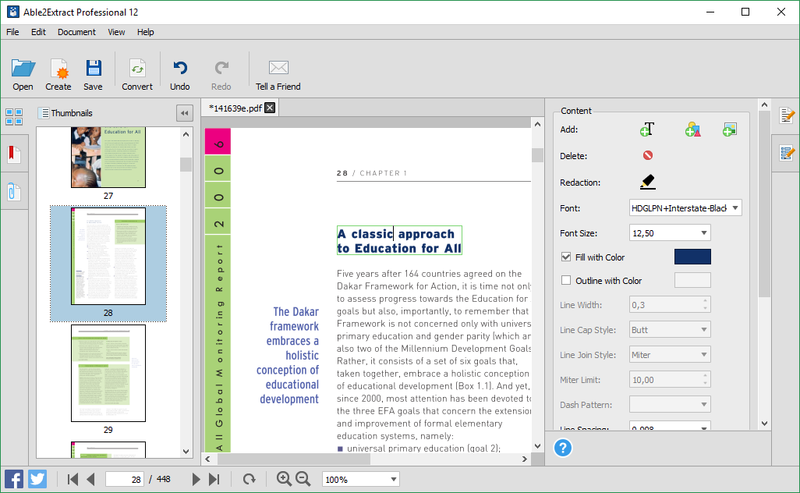 One of the best all-around PDF solutions licensed by 250,000 users. You can download it for a 7-day free trial and follow along. We wanted to make this the simplest process ever. Therefore, we organized this guide into 7 sections. 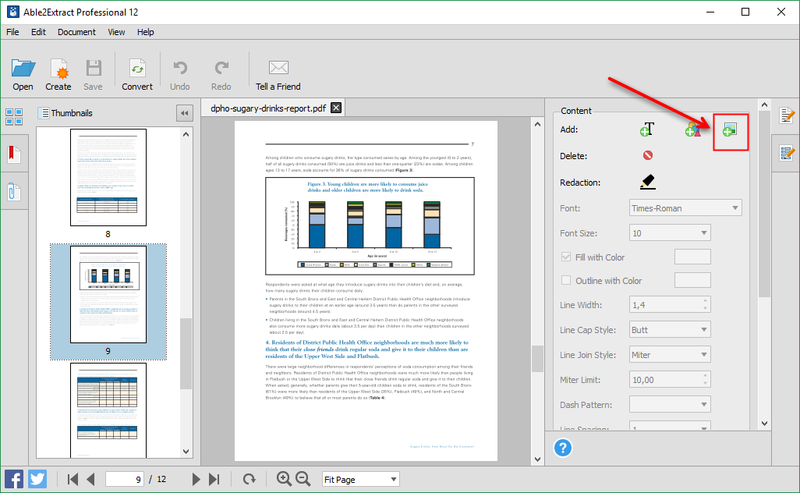 Open the PDF in Able2Extract Professional 14. 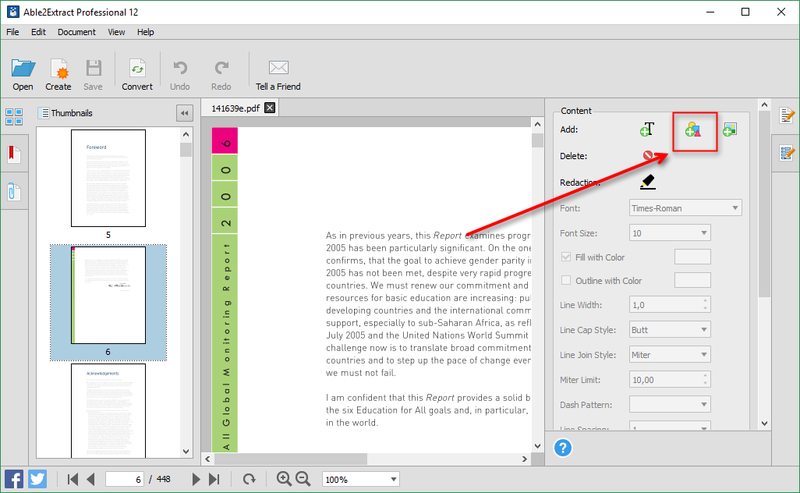 Click on the EDIT button to go into PDF editing mode. 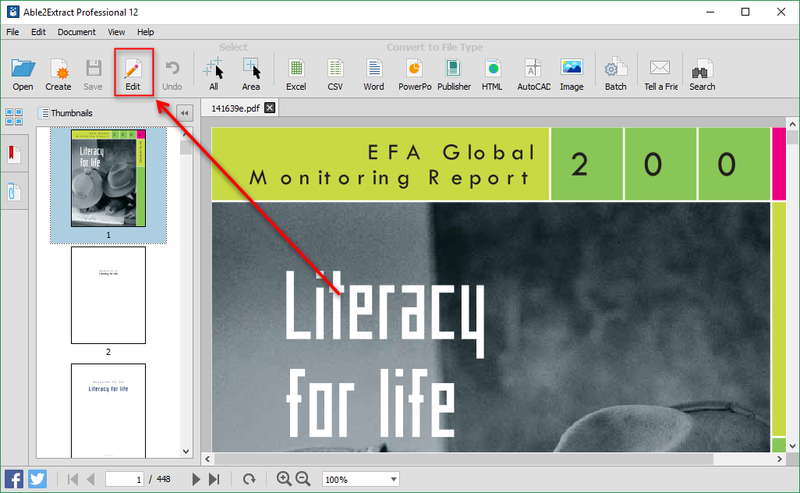 You will see the PDF editing panel on the right toolbar. 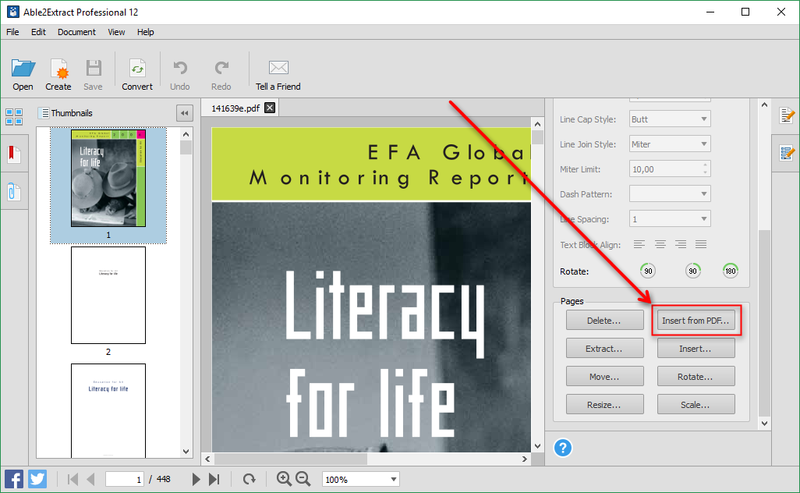 Now, determine what you’d like to do with your PDF and click on the link to jump to that section of the tutorial. Click on the text or a number you would like to edit. Use your keyboard to add and delete text, as you would in any other text editor. In the Pages panel of Edit mode, click “Insert from PDF”. 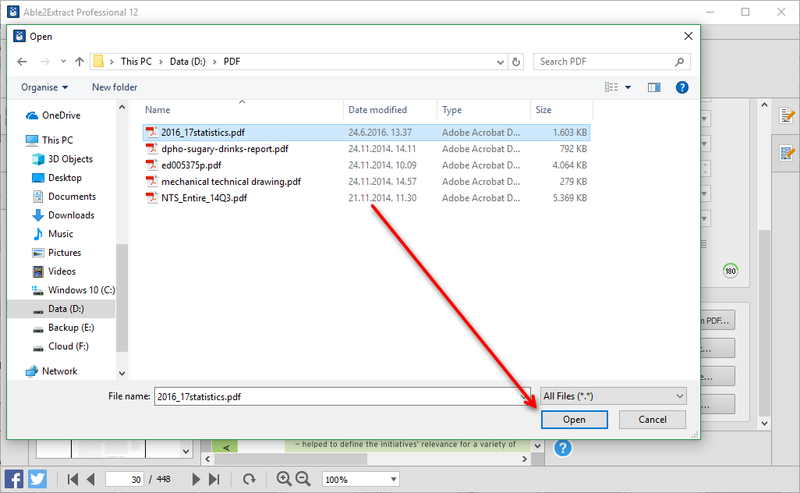 Browse for the file, select it, and click “Open”. 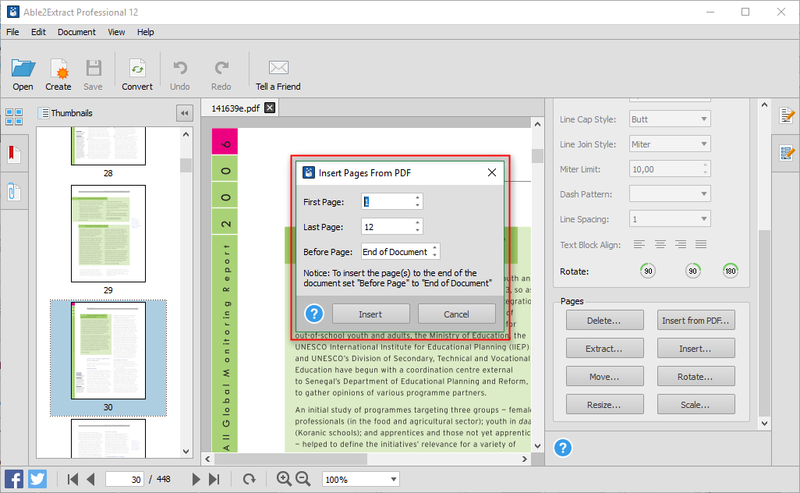 Choose the other document’s range of pages you’d like to insert and where you’d like to insert them. Hit “OK” and your PDFs will be merged instantly. 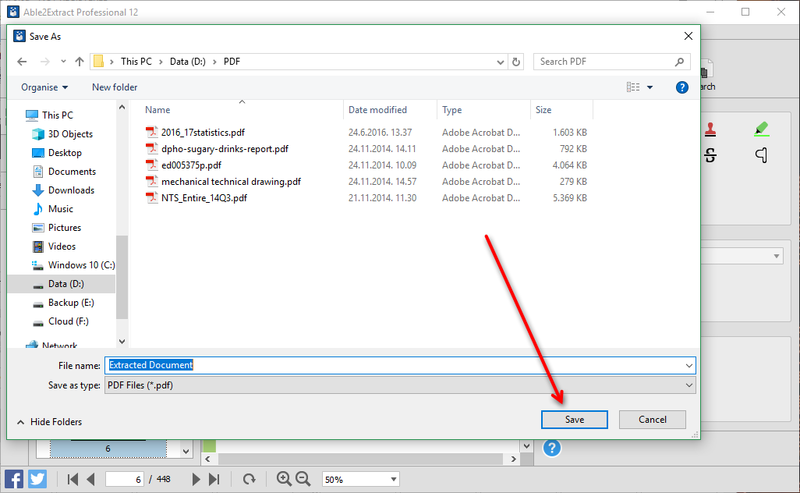 If you have a specific page within your PDF that you would like to extract into a separate document, follow the tutorial below. On the right, you will see the editing Pages panel. Choose “Extract”. 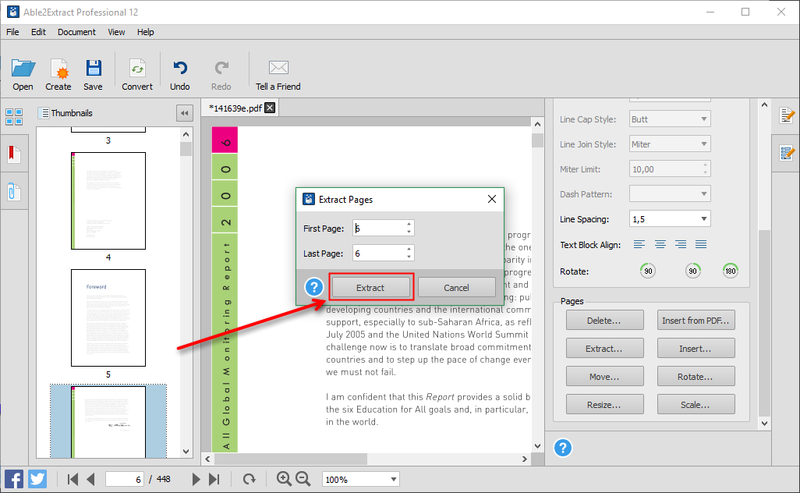 Specify the pages you would like to extract. Save the newly created PDF and that’s it! Under the Content panel, find the “Add” section and choose the last icon, which is an image with a green plus on it. This is the tool for adding images. Select your image and click “Open”. You can choose any bitmap image (jpg, jpeg, png, bmp, gif, tif, tiff). Position the green cursor at the spot where you’d like to insert an image and click. The full-size image will be added to the page with the top-left corner of the image lined up with the position of the green cursor. Resize and reposition your inserted image, if needed. You can also click and drag for better control over the position and size of the image. On the right side, under the Content panel, click on the icon with the shapes behind it. Select the shape you’d like to insert. There are a total of 9 vector shapes available in Able2Extract. Place the cursor where you’d like to insert a shape and click. You can also click and drag for better control over the position and size of the shape. 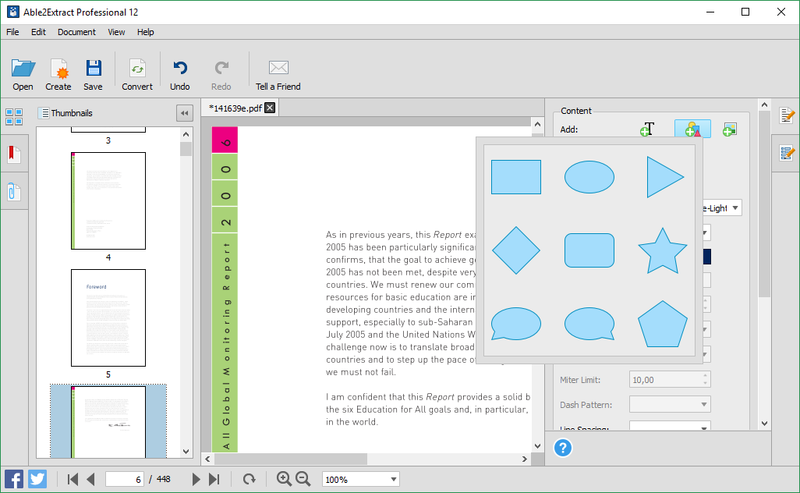 From here, you can drag and drop your selected shape to reposition it and rescale it, so it perfectly fits your document. Additionally, you can insert text into your shape and even change the color. Find an object that you would like to edit and left-click on it. Check “Fill with Color” or “Outline with Color” depending on what you’d like to do. Click on the color next to it to open a palette. 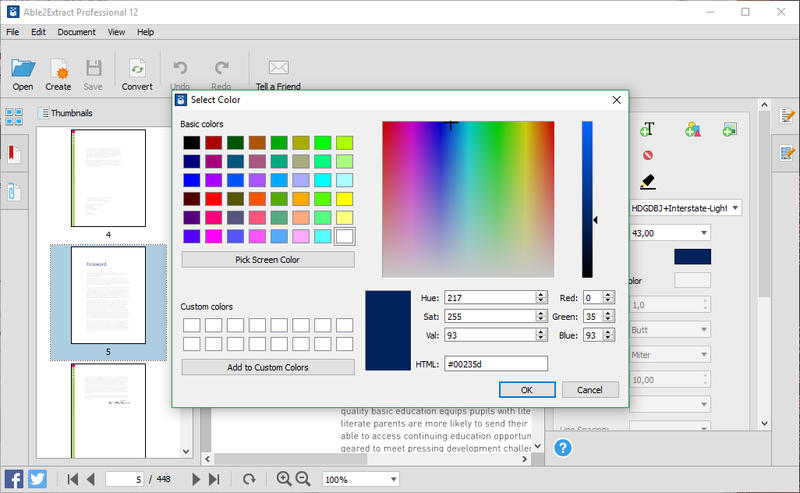 Select your preferred color and click “OK” to color your selection. This process is entirely the same if you would like to create a colored border around your selection (Outline with Color). Often times, we come across a scanned PDF that we need to edit. Scanned PDFs are basically images locked inside a PDF that simply cannot be edited using a regular PDF editing software tool. The solution to this problem is to use a tool with Optical Character Recognition (OCR). OCR is a technology that recognizes the characters from an image and translates them into digital characters which can then be edited. You can edit a scanned PDF by following the same steps as above. 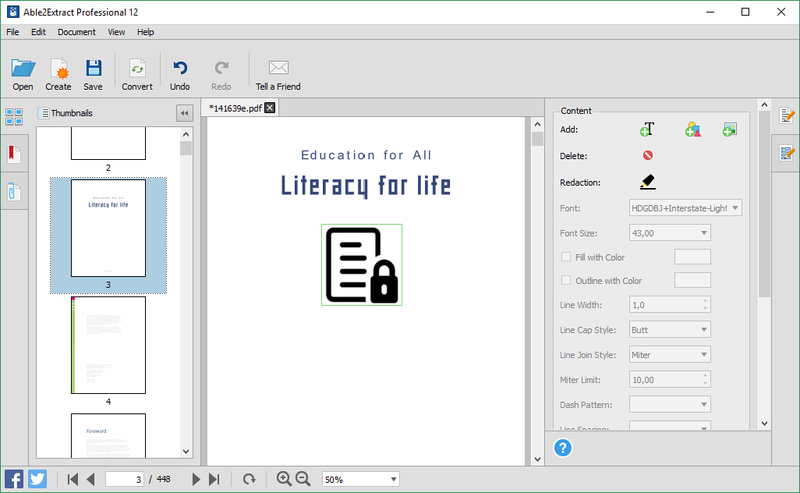 For the purpose of editing scanned PDF, you will also need to download Able2Extract Professional 14, which has an integrated OCR engine and will enable you to quickly edit a scanned PDF in the same fashion.